Lots of privacy on this 2.5-acre property located out East End Road. A short, beautiful 10-minute ride from Homer with views of the bay and mountains along the way. If you want to see wildlife, you need to get out-of-town. Easy living on one-level. No stairs, 1,100 square feet, plenty of room for four people. Living room has Satellite TV, DVD player, and stereo. Nice, covered 200-square foot deck if you want to sit outside and grill while it rains or just enjoy the view. Vaulted ceiling. Two-bedrooms with queen beds. All doorways have a 36" wide opening. One bathroom, walk-in shower, no tub. Fully-equipped kitchen with oven and cook top, microwave and refrigerator with ice maker. Washer and dryer. Light-filtering blinds in every room. 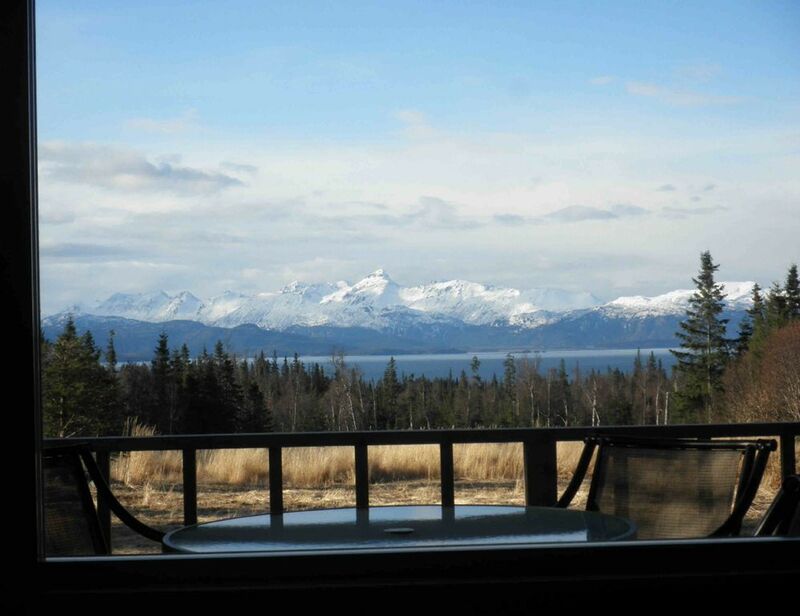 Beautiful views of Kachemak Bay and the Kenai Mountains across the way. This is a place on earth where the mountains meet the ocean, so relax and enjoy the views. Nearby, Fritz Creek has essential groceries, baked goods and spirits. Safeway grocery store in Homer offers a discount card by using your phone number. You may sign up online or in-store. Some local restaurants we enjoy include Cosmic Kitchen in downtown Homer which offers reasonably priced breakfast, lunch and dinner with quite a variety; Wasabi (which you will drive by on East End Road) offers a variety of seafood; Duncan House (downtown Homer) is a good every day diner; Lands Ends at the end of the spit offers a view of the bay. In "old town" Homer is AJ's for upscale steak and seafood dining and Three Sisters Bakery, a unique coffeehouse with homemade baked goods. New construction which is nice. Private with a great view. The downside for some (not us) may be the fact that the house is not right in town but somewhat out in the country. We preferred that. Would stay here again for sure. Clean, beautiful views, awesome and responsive owner!! Just no cell service ... be prepared to text in town.